Over the last couple of years, I’ve spent a few evenings building DIY guitar effects. It's fun to build things that you can use. If you want to get started, one of the hardest things is buying components. Try to buy a 10Ω resistor from Farnell, and you’re faced with a choice of 345 items. So, starting out buying a kit is a good idea. At least you’ll know the parts are right, even if when your soldering isn’t. However, not many people sell kits. Despite the potential markup on a handful of bulk components, the customer service is - presumably - a nightmare. 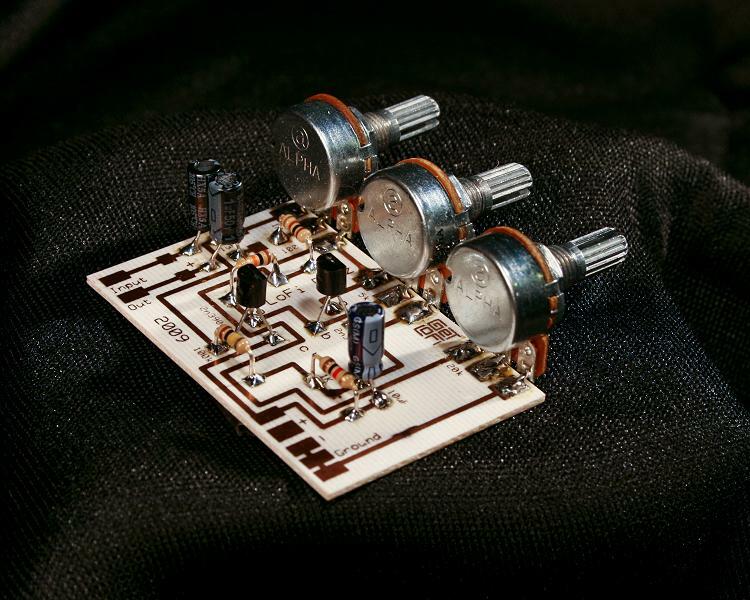 Here are 23 companies who will sell you complete component kits for guitar effects - many more people produce PCBs, or sell finished pedals. Stay tuned for similar lists on synths/noise boxes and tube amplifiers. 1. Build Your Own Clone Probably the best known company in the business, BYOC have a huge range of kits From the Confidence Booster, a $15 booster kit with no box or switch to the $150 analog delay that they describe as extremely difficult’. They have a very good reputation on the forums for selling reliable, easy to build kits. Their UK Distributor is Vibe-O-Tronic and Moody Sounds (below) sell them in Sweden. 2. General Guitar Gadgets The other big player in US kits, GGG seem slightly less ambitious than BYOC, but still offer a good range of familiar sound-alike pedals in complete kits, including switches and pre-drilled boxes. 3. OL Circuits Officially Licensed Circuits have an interesting collection of kits developed on various online communities. They sell the runoffgroove.com collection of famous guitar amps converted into pedals, plus various interesting valve circuits including the Beavis Tube Cricket amplifier. 5. Small Bear Small range of kits (boost, fuzz, tremolo) from the company who specialise in components for DIY pedal builders. 6. PAIA Grandaddies of DIY audio kits. They don’t sell any real stompboxes, but have a few interesting guitar projects like the QuadraFuzz, and an entire modular synth range. 7. Mod Kits Small range of boost and distortion pedals, plus a reverb built around the Belton Brick. 9. Get LoFi An interesting range of simple circuits including a fuzz, an amp and (coming soon) a lo-fi delay. They don’t sell enclosures or switches, just the boards and components. 10. Synthrotek A few interesting noisy kits, including a Lo-Fi delay unit and various fuzzes. Prices: $35 for the delay kit. 11. Devi Ever Devi Ever is a Portland-based boutique builder who makes endless varieties of Fuzz. She sometimes sells kits through her Etsy shop, but is currently out of action. 12. Triode Electronics Among their huge range of tube amp gear is one Germanium boost kit for $75. 13. MEK Electronic (Germany) A big and varied range of kits including a Klon clone, a delay, a reverb and four (!) varieties of Muff Pi. They’re fairly cheap. The Fuzz Factory clone they sold me worked first time, and had a very neat layout. 14. Musikding (Germany) Fairly wide range of surprisingly cheap kits from a German supplier with a vast range of DIY effect parts. 15. Moody Sounds (Sweden) Good range of pedals including the the interesting Moody Echo, which comes with a light sensitive option for extreme crazy. They also resell BYOC pedals in Sweden. 16. Pigeon FX (UK) Small range of nice mojo-ish kits: Fuzz Faces and Rangemasters with carbon comp resistors, dark brown PCBs and big ol’ capacitors. Prices: £15 for the boards and components. 17. DIY Stompboxes (Germany) Big range of curiously translated but familiar-looking circuits, including clones of almost the full Zvex range. 19. Boutique Techniguitarre (France) A small range of distortions and boosters, available in pre-drilled boxes with appropriate stickers. 20. 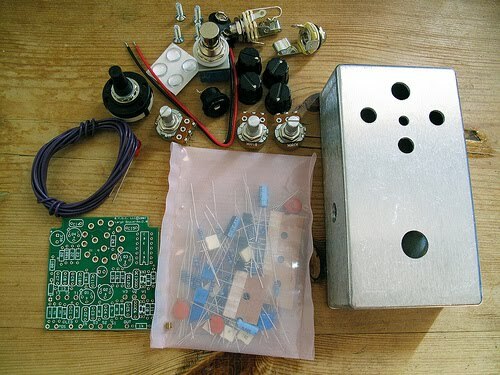 Ess_7Stores (China) An Ebay Store from Hong Kong selling an interesting-looking point-to-point wired (that’s putting it very politely) FET Fender Blackface preamp kit. 21. Quasar Electronics (UK) A handful of guitar circuit kits from this old-school Velleman-ish educational company. I tried to build their trem and managed to mess it up, which is no reflection on them. 22. Beavis Board $250 gets you a breadboard, specially made audio/power connectors and a complete kit of parts to build numerous projects. I thought about buying this when I first got started. I wish I had. If you are one of these companies and I’ve got something wrong, do get in touch. Main image: BYOC kit by Terekhova. Wuhu! Back online... well... for a few posts anyway. I've been looking into DIY pedals just last week. OH MY GOD! Tom, I can't tell you how amazing it is to see you back online. My brother and I were talking last week about how much we missed you. I'm very much in favor of BYOC pedals. I've met the guy at guitar shows in Texas, and he's very, very nice. Great quality, thoughtful design and fantastic tone. I liked the Quasar spring reverb driver kit, includes some simple tone controls, thumbs up. Oh my. Please start posting again. Easily one of the best music blogs ever. I might even write a song about it. I'd love to hear that song, Derek! Nice to the old Music Guy posting again!